I know we go through this on what seems like a semi-annual basis now, but for those that are watching the news and are concerned about "the coming U.S. debt default" let me remind you: don't! Turn off the news and go read a book, spend time with your family, or watch a movie. As David Stockman explains briefly and succinctly in the Bloomberg discussion below, the United States will never default on its debt. 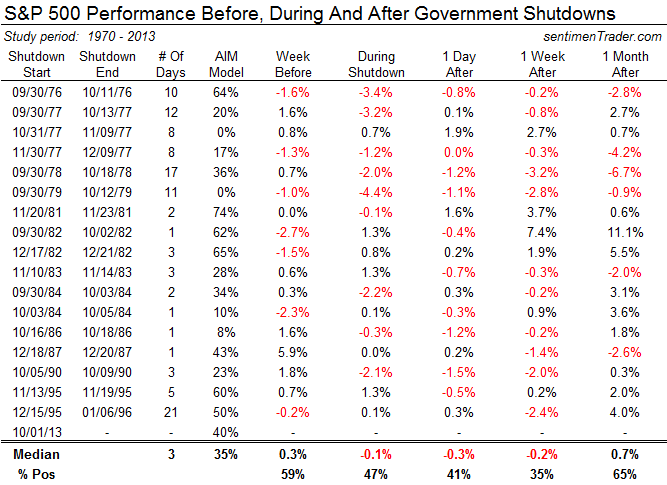 For a short period of time will they have to cut back on specific areas of wasteful and unneeded government spending? Maybe. And the response to that? Great!! The U.S. at some point will face its day of reckoning, but I assure you it will not come because politicians are trying to do the right thing and cut spending. It will come the day the bond market decides it will no longer fund a bankrupt country. The bond market will decide the day the U.S. no longer can live this fairy tale. That is the real concern, and it is very real, not the current charade you see taking place on the news networks 24 hours a day. 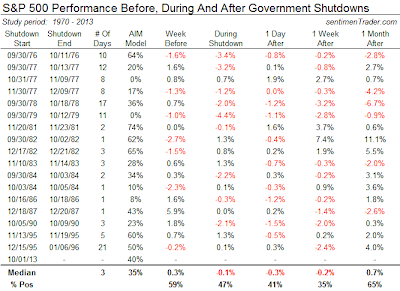 Looking to the past and the mixed performance of stocks during shut downs, you can see that the market does not really care. If U.S. stocks fall from here it is because they are extremely over priced.